You haven’t heard much from me yet. I’m a co-creator of Authentic Blogger with Dawn, and I’ve been handling the IT end of this site. 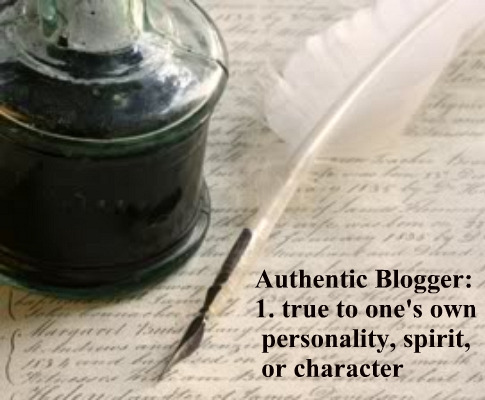 But today, I’d like to discuss one of the main purposes of Authentic Blogger and give a few geeky details. 4. After highlighting, press “Ctrl + C” on windows, or “Command + C” on Mac. This copies the address. 5. In a new window, go to the Authentic Blogger wall. 6. In the box where it says, “Write Something,” tell us a little bit about that particular blog post. Explain in just a few words what inspired you to write it or what it is about. 7. Next, look directly below the "Write Something" text window where you put your personal comments and find where it says Attach. Next to Attach, you will see a series of icons, with the first being a piece of paper with a push pin. This is the icon for posting Links. Click on it and this will produce a new text box window with "http://" showing. Put your cursor here, right click and "http://" will disappear. Now, insert your blog link by hitting “Ctrl + V” on windows, or “Command + V” on Mac. 8. After you see your blog link appear, click the blue “Share” button. 9. If it didn’t work, you can practice on this website. 10. If it did work, Congratulations! If you have any questions, don't be afraid to comment on this post. I promise to answer! Or if you prefer, you can send an email to authenticblogger@live.com. Thanks for listening and for making Authentic Blogger a success. I look forward to seeing your latest post on the wall! We will also post these helpful How To Hints on the Discussion Board on the AB wall. That Discussion Board topic, entitled Blogging Tips 101 will be a “living document” that we pledge to continue adding tips and suggestions to and will always be accessible for you to pull up, copy and download to your personal files. Finally, a very important request!!! Please remember to take a moment while you’re here to follow our The Authentic Blogger blog page! We sometimes forget to sufficiently bring attention to our sister (to the AB group page on FB) blog, and we do want to grow our readership and followers here. Please also take a moment to tell your friends about The Authentic Blogger blog page so they can visit! Thanks for the tips. I have posted something already on the page. I would like to know how to "Grab a button" like you have on the top of your screen though. KingsKid777, On your personal blog, hit Add a Gadget. Now, copy and paste the html code below the Authentic Blogger button, and insert it into what's called Java/HTML gadget. Hit save, and the Authentic Blogger button will appear! Thanks!